Products that have a nickname AQUOS mobile phone is a combination of intensity in the field of provision of Sharp LCD and sophistication in the company is making products based on the needs of the mobile phone market. So, do not wonder if the word AQUOS mobile phone attached to the product has an actual meaning. As we know, Sharp at this time the many types of LCD TVs with the same name, namely AQUOS. Like almost all Japanese products that have been launched, WX-A92 uses the form of the fold, such as body shell oysters as the main design. The form of the so-called call-tune by a very large Asian nation this luxury when made visible with a slight right angle and a clear glossy material selection combined magnesium and plastic in most of the surface. At the time of the fold is closed, we can see the overlap, but does not reduce the beauty of this mobile phone design. That the WX-A92 hide interesting mechanism. There is a hinge so that the object of this mobile phone screen can rotate 90 degrees to the right. Changing the screen orientation to be horizontal and appear as wide screen LCD. They called cycloid. Wide-screen ratio is 16:9. As a comparison, the ratio is as much used by the LCD monitor and LCD TV screen width. 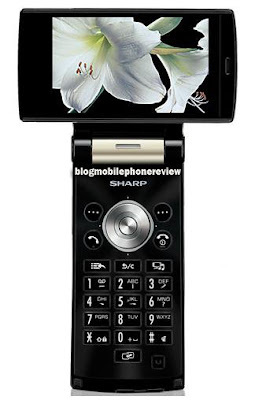 Sharp AQUOS WX-A92 is capable of surprising winner at the screen. Name AQUOS into a real savings. In this case, they introduce the latest types of technology which they call as the mobile ASV, stands for Advanced Super View. Based on information circulating, such as the type of TFT screen has a contrast ratio of 2000:1. Quite large and indeed felt better than usual on the type of TFT screen which still dominates the mobile phone now. In addition, mobile ASV that Sharp has carried the colors to achieve true high-color, 24 bit alias over, 16.7 million colors or more. With the same technology offered by the LCD computer or LCD TV in your home. Special WX-A92 in, offered a resolution to be regarded large 3.2 inch screen sizes, ie, wide VGA (WVGA = 854 x 480 pixels). As a comparison, as this resolution is still better than the Blackberry Bold 9000 and one of the products that use the ASUS VGA resolution (640 x 480 pixels). In accordance with the needs of mobile phone market in Japan, this mobile phone network using WCDMA 2100. Network which is the backbone of 3G is already old accompany typical Japanese type of network is created by NTT DoCoMo. WX-A92 is also a mobile phone that has been equipped with HSDPA. We can access data far faster than 3G. and as usual, a network that also accompany the remains of EDGE and GSM (GPRS) as a means of internet connection alternatife. Some codecs also have to be able to deliver streaming video with great resolution, the resolution to 320 x 240 pixels. Supported by HSDPA speeds this can only occur without restriction. However, the quality and stability of impression will depend on the quality of the HSDPA network operator that you use. I do not like is, WX-A92 is not equipped with a secondary camera for videocall. You must use the main camera for this purpose, and a little difficult. Almost all of the multimedia mobile phone can be included in the WX-A92. However, a special camera in hand, we will be slightly disappointed. Resolution 3.2 megapixel maximum resolution is not available in a mobile phone. Although the digital camera software that was quite satisfactory with the autofocus, the mechanism and performance viewfinder photo leaving a little curiosity. Adjacent to the camera. Another thing is the new media interface. We have been in view products Sony Ericsson. With a good screen, this will appear more attractive, not less from the media menu on the Playstation 3 or PSP. In addition to cameras, from mobile phones can access the music player, video streaming and java games. All that looks good because it is assisted by the display. Special music player, the output from the speaker is less pretentious. Sharp as a solution to provide a special headset with a traditional port. Less flexible when compared with other products that provide a 3.5 mm port. Some additional features that most dominated by the PIM features are still accompany the phone. But one thing that is unique is the presence of Picsel document viewer that is able to use to open files such as word documents, exel and power point in this phone. However, it is still less than the maximum because it is not able to do editing directly in the phone. This mobile phone equipped with a complete connection facilities, including the data cable, infrared and bluetooth. You make it to music, also has A2DP profile are presented, allowing you to listen to audio files via a compatible headset. The first question that will appear, whether the battery capacity of Lithium Ion 800 mAh will be able to survive for long features lavish energy that brought this phone? However, when tested, the battery is capable enough to live for two days with the little that is often in the charging. However, the use of HSDPA will make them more quickly exhausted. AQUOS technology on this phone because it is a successful enchant something new. Something that can be wait-awaited by almost all age users HP. Young people will like it because it can play games on the big screen, browse and open the site with a social net-free, while those who are older will love the big font size offered.